There seems to be a little controversy over the streaming videos from the show. So, I haven't yet been able to find the streaming video clips of the classes posted yet for viewing. If/when I do, I'll include links here. I also hope to post a video from what I was able to capture.....soon. So its Saturday...and the long ride home is ahead. I wake up, but decide that 6:30am alarm is a BAD idea...so I turn over and try to rest a bit more. I can hear Jane is up and about downstairs, and the smell of coffee is enticing. But so is the pillow. If Scott were here, he'd pull me out of bed and onto the floor by the ankle...but he's not here. So I turn over one more time and try to get a few minutes more rest. Then I think of Diva, and decide it would be good to put her out in the paddock while I finish packing so she can stretch a bit before the 12 hours ride ahead. Up and at 'em. I can tell Diva knows were going home. I think I see dread and excitement in her eye. I told her we're going home...and she lifts her head a bit. Fashion will be so happy to see you! She nickers back in agreement. Justice's stall is all clean and his again. I pack up, move hay, clean out Diva's stall and top off the shavings so that Justice has a ready stall. I'm sure he'll be glad to have it back. As we pack, I'm kinda sad. Its been a good week, and staying here has been relaxing and fun...for both Diva and I. The sky is over-cast...and I see a crack of lightning and then thunder, which hurries me along. I figure I better move so I'm all packed and Diva loaded before this storm rolls in. REALLY!? SERIOUSLY?! (those SO overused words scream in my head!) 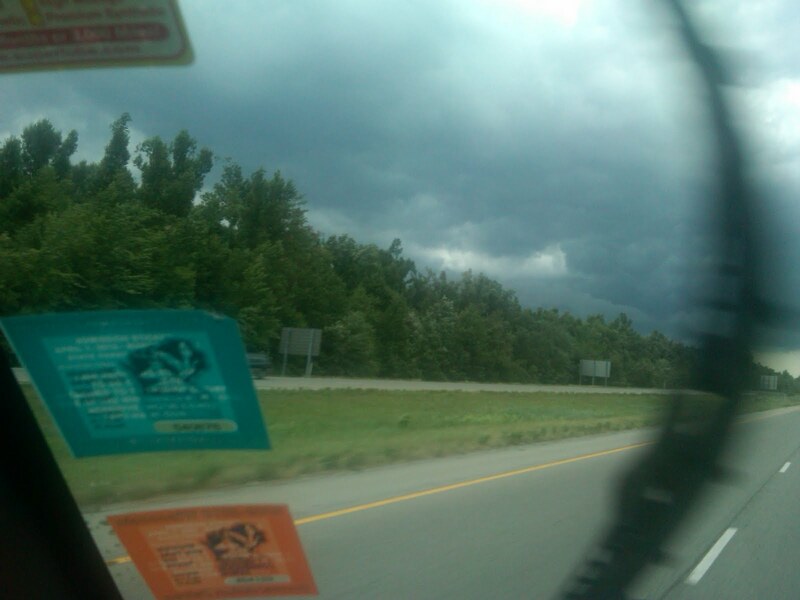 I'll be traveling in a storm AGAIN. 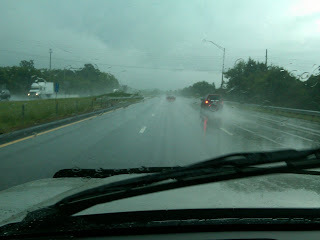 Arghhh, a bad storm hits as we leave Nashville. Diva sticks out her tongue at truckers at the rest area. I pull onto the Interstate just as the rain really starts to comes down in sheets. 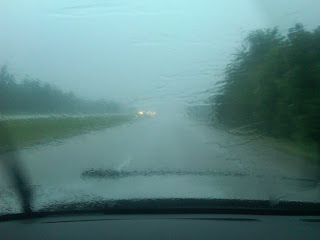 I can hear sirens all over...and as I drive thru Nashville, there are numerous cars off the road. Even two pickup trucks at one curve. In the grass you can see tire skids and one truck is backwards, the other down into the ditch. Yikes....many have been caught off guard by this storm... But, as I pull out of Nashville, and into Kentucky....its blue skies and fluffy clouds ahead. The rest of the trip is mostly uneventful. We make a few stops, and I fill up water bowls for Diva each time I stop for gas or the rest area along the way. We make way better time going home...as I'm able to set the cruise control to 65, the radio to Highway on XM and just steer and sing country songs on my way home. Thanks Eric Church for entertaining me al the way home! Not a lot of traffic.... I get numerous calls as I ride home...people checking in with me, and it breaks up the ride. Scott, mom....a text from Michelle. And then a call from Jane. OMG...lightning struck the tree in her front yard where my truck and hers had been parked. And she said her blue truck was hit...it was actually smoking!!! Shock turned to laughter...but it totally was not funny! I guess I left in the nick of time... I insisted that she call the firemen, just in case. Smoking vehicles are not funny. And besides the firemen might be cute! LOL. I get excited when I see the 'Welcome to Wisconsin' sign. Scott says he'll have dinner ready. I pull in just minutes after 7pm. It feels good to have that gravel drive under my tires again. I round the curve, over the culvert and thru the trees....and then I see the best sight ever for these tired eyes....Scott is on the porch waiting for me and waves. I pull in down by the barn and notice that there is paper taped to the barn. Maybe Scott was painting...but its weird and flipping up and down. As I pull closer, I can see that each piece of paper has a letter printed on it. The breeze keeps the letters in motion...so I wait as I look thru the truck's front window...and try to make out what it says. "W e l c o m e H o m e C h a m p s".... awwwww! As I turn my head, I see Scott is walking down the sidewalk...he's smiling (kinda a crooked grin....but he's obviously proud.) I jump out, and into a big hug.... Mmmmmmm, it feels so good to be home. He puts his arm around me, and we look up at the letters flipping again. I smile up at him...and he squeezes my shoulders. This was certainly a team win for us! I show him the championship red ribbon....and the gold trim sparkles in the sunset. We both smile. Welcome sign on barn for Diva and I! We unload Diva. Fashion is already in the pasture and comes cantering to greet her...and the two of them rumble off to eat grass. She's kicking up her heals, he's flipping his head. They run, play....and I'm thankful that she seems to be doing just fine from that long ride. I guess she'll sleep well tonight...and in the morning she will have a mane filled with shavings from her stall. We toss in a pizza, and sit on the front porch to catch up on the week of events. Scott has tons of pent up discussion to be had (yeah...he talked more than I did that night...LOL, believe me, even I didn't think that was possible!). We talk late into the evening over a few beers. He shared his stories of what he saw on the stream of the Walking Horse Chat, I gave the behind the scenes details of each ride. And we talked about Diva. And we talked about Bourbon. I know that Saturday Night Live came on, it was a presidential skit of course....but my exhaustion takes over as soon as my head hits the pillow. Sweet dreams. On the last night of the show are the Championship classes. I had to decide on Friday morning before noon if I would show back for the championship class for AOT trail pleasure. I hemmed and hawed about it, and decided to do it. 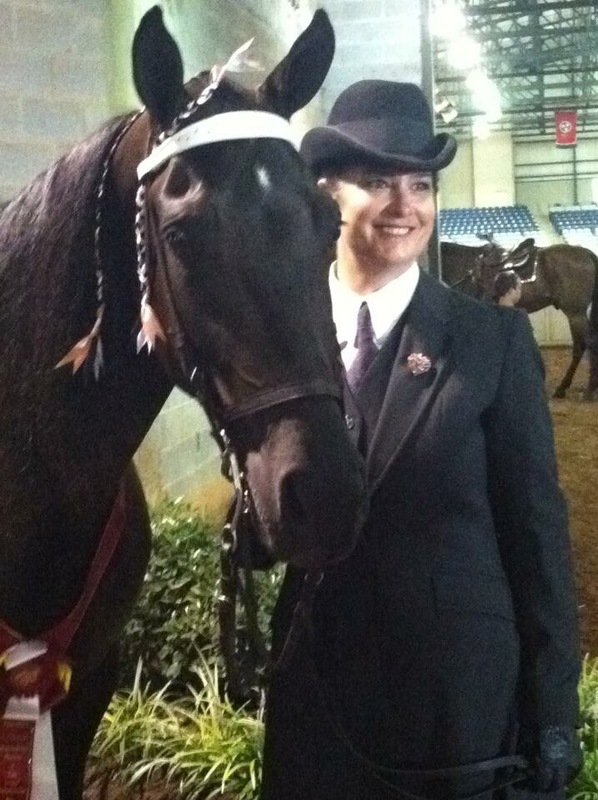 Maybe this would be my last ride at a show like this with Diva, and so why not. That ring is so cool to ride in, it would be worth it just to do it one more time. Class 148. I called the WHOA office before the deadline of noon, and heard myself say, p.ease put me down for class 148. I hung up and said....well I better get ready. I decided to try a different bit on diva that morning. One that would get her head up more. We had looked online at the show photographers website at prior days classes, and I felt she had her head lower than I wanted, so some adjustments were in order. I gave her a test drive at janes, and it felt much better, and Jane agreed. Higher in the head and more backend! Perfect. The Scoop interviews me upon exit. Then after what always seems like forever, they call for class 148. My ride is good. Her head is high and she seems more experienced to the ring and the whole scenario. Into the lineup, and then the wait for the awards. I look up into the audience, and it's a cool feeling. Take it all in I tell myself. My very last ride of the International. I'm exhausted. I'm proud of myself for doing it. The announcer comes on, and calls the winners number. It's Maggie Moore and just doin my time. A very experienced and notable AOT. I think that horse may also hold a world champion title. She rides up for the award and photograph. And then they announce the reserve is number 972, I'm demanding and Renee Stasiewicz for the reserve. I pull out of the lineup and over to the reserve ribbon girl. It's Sis Osbourne and she has a long long red ribbon that goes all the way around Divas neck. She reaches up, puts her arms around Diva and hooks the ribbon on. She then informs me to stay in the ring for a victory pass. oMG, I get to make a victory pass. This means you ride solo around the ring as you exit. I make my plan of which way to ride. And there is only one right answer. I have to ride counter clockwise, so that Scott can see it on the streaming video at home. The announcer once again announces our win for the reserve, I'm demanding and Renee Stasiewicz makes the ride for the reserve. Diva starts too fast, so I check her, and try to make it count....watch us Scott, I wish you were here to see this! And there are cheers. We worked hard, and the judges saw her talent. Yeah! And then there are happy tears. Not just mine, but jane is at the gate and she running to catch up to me and we hug. It's been a long stressful week, but this made it all so worth it. Many people congratulating you. Pictures, and even the paper reporters interviewing you. So maybe I'll make the scoop or something. Lol. Our photo taken in the winners circle. The ribbon is very cool. It looked so beautiful around divas neck. And honestly, (whoops sorry Scott for using that) I would let her wear it all night and all the way home to Wisconsin, if I thought she wouldn't get it dirty. I can't wait to hang that one in my barn. Maybe next to the coolest photo of the moment, that Connie Waldo captured of me in the championship ring. I'll try to add that shot to this blog when I get home. My smile tells it all. Well it is like 2am now, and I have a long ride back tomorrow. but stay tuned for my wrap up to come. Good night. First of all, I'm sorry for missing a day of blogging. Been crazy busy with the showing. And when we get back at night it's almost straight to bed. I'll confess, I have slept in. Although when you show until midnight, I'm not sure sleeping till 8 or 9am can be considered sleeping in. Jane rides in the spotted class. Shows start at 5pm each night, as it gets much cooler. Um, like 90s vs 100s. Ive begun anticipating 8pm when the temperature breaks. Until then, believe me that getting into a show suit is torture. Literally you feel like you are melting. Wearing jeans and T-shirt is bad enough, but the formal suit, vest, shirt and tie and derby hat, well need I say more? Okay then add in the championship attire, and my black suit is wool! Urghhhh. Pretty in pink - getting ready to go into our class. Bobby has been bringing multiple FILLED trailers to the show each day. Plus Jane and I are hauling the AOT horses separately on top of that. At the show each trainer sets up their tack area. For the colt center it means dozens of western and English saddles, equal amounts of bridles, girths, and untold other brushes and gear. It's a team effort and multiple trips from the trailer to the warmup ring where we are stationed. Our corner is convenient. Our trailers are parked outside the doors, right by the show office and ladies room. Btw, the show office and ladies room are air-conditioned....a major bonus for changing or just catching a break from the heat. Carlan exits in the ribbons with Vegas. Upon arrival it's hoof black and braid work, Grooming and primping. The announcer can be heard well in the warmup area...so you can keep track of what's going on inside. By the third and fourth days of the show the class numbers are beyond 100, In fact more than 165 total classes in 4 days. I think at one point they announced more than 1000 entries. Wow! Some of the participants are stalling horses too. 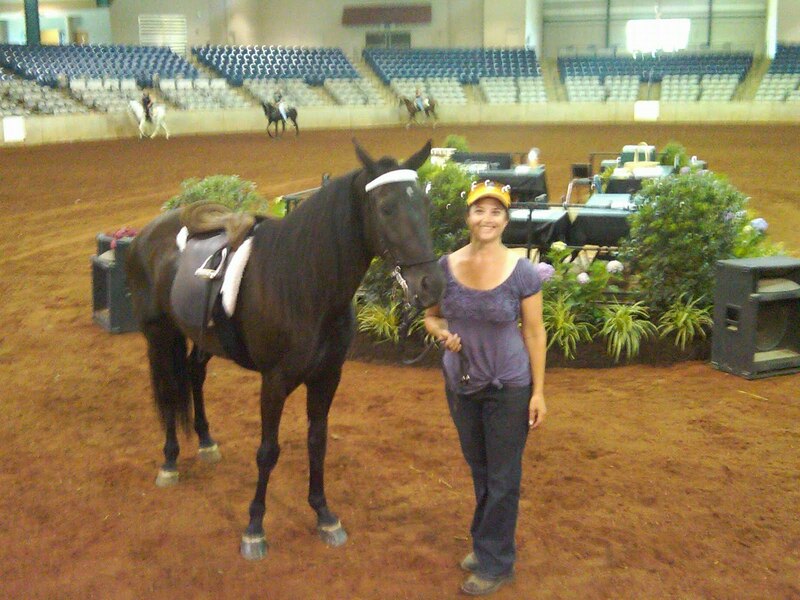 One trainer is from the west coast, Hanna Pulvers is from Oregon! So I'm not the longest distance traveler. The semi trailers are amazing with rigs to match. My little two horse trailer parks next to a a semi truck all decked out for horses. They literally have two! hydraulic ramps come down, and the horses are brought down the ramp from what seems like the second floor. Not sure how many horses are onboard, but it it totally amazing. Some of the riders have fresh horses for every class. And it seems like they are in dozens of classes. And then there is little o me putting one horse in multiple classes. LOL. Were not in Kansas anymore Dorothy. The coliseum is about the size of a football field I'd say, and it has stadium type seating. The spectators are sparse despite the size of the show in entries. Typically the participants run to the ringside to watch a particular class and the go back to the warmup ring. It's more of a constant buzzing of motion, than folks sitting to watch. Like a bee hive of activity. Swelling towards the rail side as a class starts, and then back out with the tide. I'll get right to the punch line....diva had a reserve ride last night! OMG I cant believe it. (that's second place for some of my none horsey friends). The second was out of 17 horses. And then a 4th out of 19. And another 4th out of about 9 horses in the most competitive class I went into of the night with her. So overall I'm extremely proud with her performances. I rode Bourbon as well, for a 7th place ribbon. That was probably very fair as I had a tough ride on him being only 2 among horses that were 4 or under and more broke. I still have to find my seat with him and that only comes with practise which is hard to do with him in TN and me in WI. BJ rode him much better than I in an open class! All told, my horses were always in the ribbons. Something to be very proud of for sure. So with that out of the way, I can rewind. 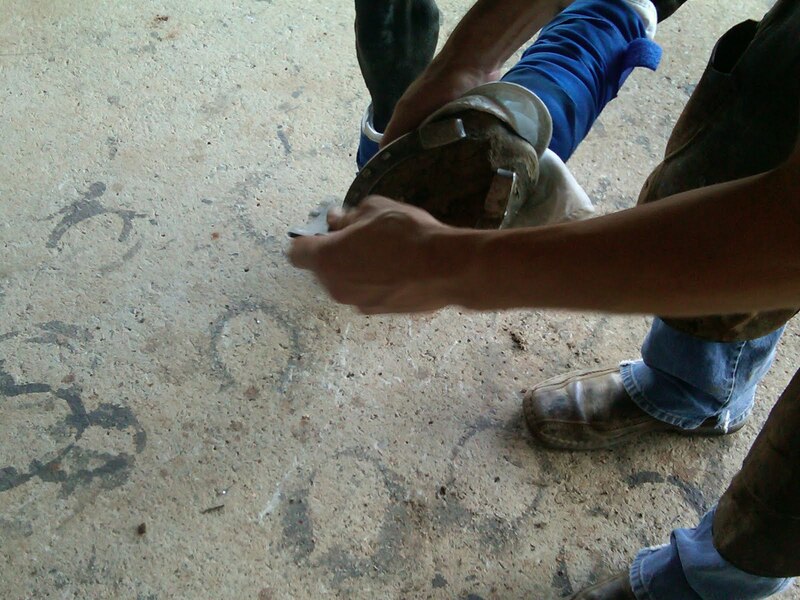 The day was filled with washing, grooming, double checking tack and the general show prepping activities. The only difference is that its being done in 100 degrees! Arggggh I don't like to 'glisten' this much. I brought my portable water heater so the baths were warm. And I helped Jane trim Justices ears. Our plan was to leave at 3 for the show. But by 1pm we were both getting the show gitters. However between us taking showers and eating something we left on time as planned. We parked near the warmup ring and unpacked our tack and set up our things. I was very happy for the new folding chairs Scott bought me for the trip and used one all night as my main station. Then the big decision. Orange or pink? What color to wear in the ring. I decided to do orange as that is Scotts preference and would match my coat and tie with flame colored ribbons on Diva. I guess we'll either burn bright or crash and burn. So flames seem very appropriate for the upcoming result. When Stacey saw me braiding she commented on the colors. LOL. Okay maybe it was a little loud. But the judges won't miss me. Besides it's vols colors of Tennessee tech! That couldn't hurt me. 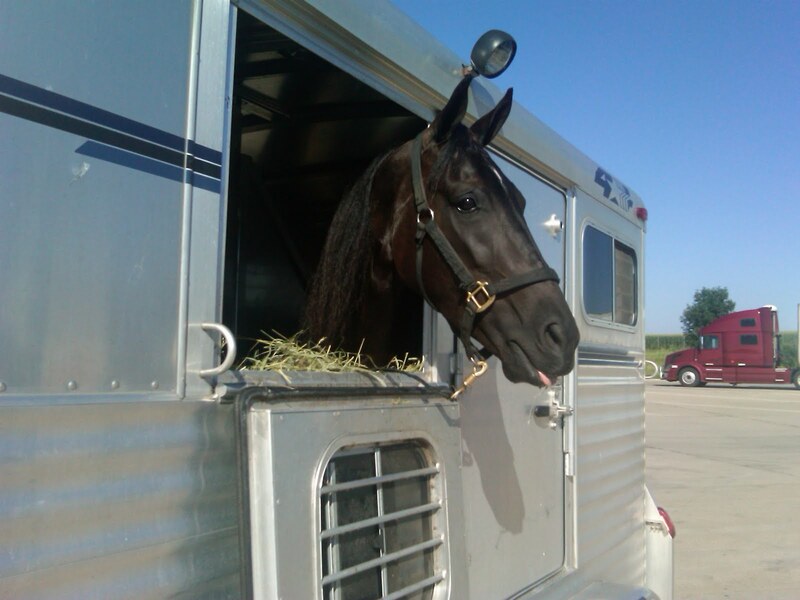 Diva waits patiently at the trailer. Bourbon waits not so patiently at the trailer too. When Bobby pulled up I was surprised to find Bourbon among the herd. And the fact that I would end up riding him after all. I wigged out. But in Rhonda's reassuring words (thanks Rhonda)...it was a good thing that I was riding, as that meant he was ok! 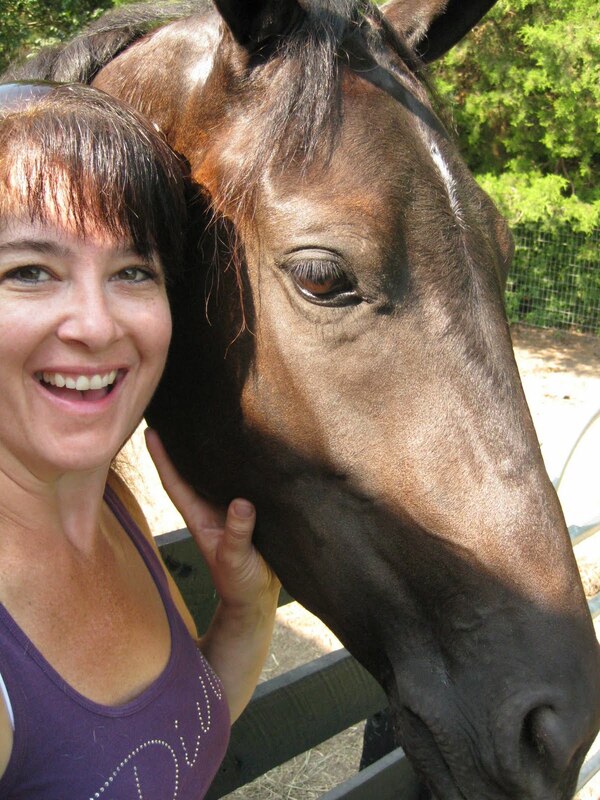 I took those words to heart and tried to get mentally prepared to now ride two horses. Oh did I mention their classes were almost back to back to back. D then B then D. Good thing I picked orange, as pink would not have looked too good on B, a sorrel horse (yes folks I own a horse that isn't black!) Although my flame theme was now starting to worry me a bit. The warm up ring was filled with riders going round and round. Western, English, trainers (many famous in the walking horse ranks) amateurs and youth. I recognized many faces and horses. Nice horses. Very intimidating. But then I thought, how cool is this. Just ride and try to have fun. 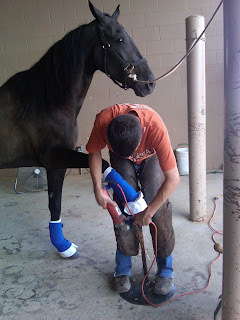 I took Diva through the DQP station where they check her shoes. And of course I passed. Then I tacked her up and began to warm her up. Circles, circles...I did them Scott! And then joined in the relentless warm up carosel. The earth was nice and I could hear divas gait, it sounded good. The dirt is red brick in color. That gets on everything. Coats, boots, saddles, I bet I'll be cleaning that off for months to come. Then they call my first class, a novice class. Everyone begins to line up and file into the ring. It's a long aisleway and you go through an archway type opening and through the people walking, past the flowered winners circle area, then through the gate and into the ring. I could hear my heart pumping, then the blast of cold air hit from the air-conditioned arena as I entered. And divas feet were pounding with my heart.... 1 2 3 4. 1 2 3 4, as we gait into the arena. Scott told me to show her best with the first impression and keep it up from there. I was hoping to not disappoint. She felt good, and just was eating the ground. I had to slow her as I think the cool air was giving her a boost of energy as well. Or maybe she knew we were showing and was enjoying the ride as much as me. My nerves changes to a smile that I couldn't refrain. Here I am. I'm doing it. And she feels good. Consistent, shaking, walking. I went through the gait calls, flat walk. Running walk. Reverse. Flat walk. Running walk...and then into the line up on the west side. As I parked in I looked up into the stands and thought she couldn't have done much better than that. I couldn't have asked for much more. She had an almost flawless ride. I was proud of her...and all the work that got us to this point. Then the wait in silence as they tally the judges cards. And you wait and wait. The announcer came on and said, that the person who won this class would never be an international novice again. How pivotal of a moment. The number was called, but it wasn't mine. To say I wasn't disappointed would be wrong...you have to have hope right? But my disappointment was short lived as 972 was called for reserve! That was us! OMG it was us! I couldn't believe it. I grinned all the way to pick up my red ribbon, and was met with a smile and congratulations. 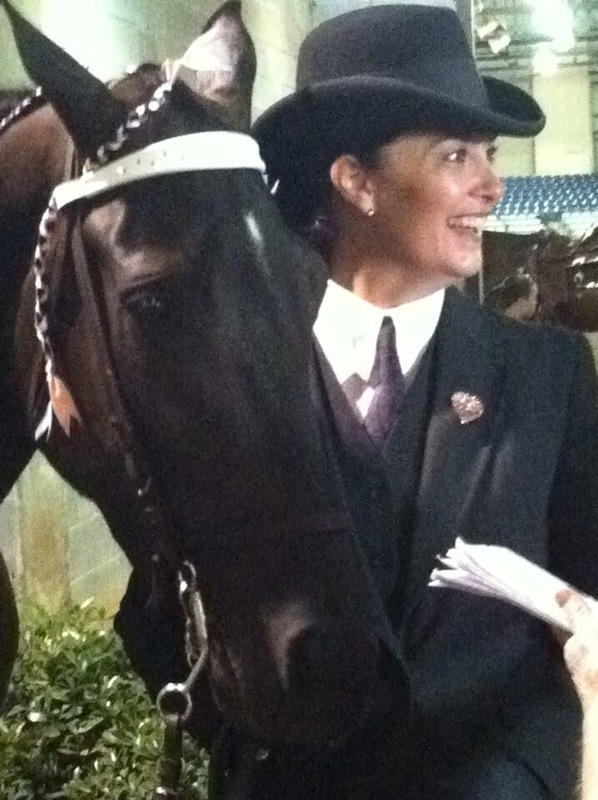 And as I exited the ring it was Connie Waldo who was first to congratulate me with another smile. She had even coached me from the ringside...which was so appreciated since Scott wasn't here to do that job. When I got back to my tack station, Carlan and Stacey were open mouthed to see the red ribbon....wow that's great. You did great in that huge class. Maybe it was the novice class, but I'll take it. And it gave me the confidence to keep moving forward for the night. I also found out later that one of the judges had placed me first on his card. There are three judges, and scores combined for the final awards. But that felt really validating. And at the International. Just wow. I won't bore you all with the agonizing details of every ride. But I will share that we were always in the ribbons. And there were some very very nice horses in my classes. I am proud to be among those I competed with. I'm exhausted. Hope to rest more today, and get diva to rest too. It's been a long week and many new adventures and stressful situations. She is very resilient. We have only one class tonight. That will be good. You're up and you're down. You're in and you're out. Please someone get this Katy Perry song out of my head. For anyone who wants to torment themselves with me, you can download it from iTunes for 69 cents. This will make sense later. Got up and went out to check Diva and see how she's doing. I put her out in a little paddock and tossed some hay. She seemed fine but obviously restless. She's alone and decided to check out every inch of the paddock just to make sure. When I moved the truck and trailer she got very upset and started running and nickering. I totally think she thought I was leaving her. So I sat down and had a little chat with her and she ate. Yeah. No show today, it's a day for Diva to get her legs rested from the long ride, and for me to ride Bourbon. So off to Bobby's I go! I'm so excited, haven't seen him for a few weeks. I talk to my mom on the walk over - gotta love cell phones. I'm staying at Janes that just happens to be across the street from the trainer, which is so convenient. Diva in her home away from home. I arrive to lively activity. Dr Gladney is riding, Stacey and Carlan are bathing a cute weanling, the boys are working more horses out the back and Bobby is prepping. The whiteboard displays the show schedule and it is completely full. And it only shows a few of the days of class plans. There must be 15 or 20 different horses going to the show from this barn alone. And Bourbons name is there too. Whew! But wait a minute? Why am I in the 50 and over class? And why is it in pink letters among the black with stars all around? I turn to meet a grin from Bobby...it's his idea of a joke on me. Ha ha. I'll get him back yet. But the grin turns more serious as he tells me the vet is coming out to look at Bourbon today. Seems we may not ride after all. Insert Katy Perry here. We'll see, is the verdict. Darn. I get a viewing of Carlans beautiful new western show saddle, and then decide to refocus on Diva. So I walk back and saddle her up. We had a nice ride and I think it went a long way to calm her more too. Then it was off to clean out her stall, the trailer and prep. Carlan saves me with an afternoon run to Steak and Shake. My first time there. YUMMY....great shakes btw. The evening was a girls nite out for a birthday dinner for Jane. She's 25 again. Fab dinner at The Firefly - my seared tuna was so wonderful and the conversation and laughter even more so. Then off to hear a jazz band at The Bluebird Cafe, that was as great as any in new orleans. I'm reminded why Nashville is called music city! Then its a wild toad ride back home with Jean. We raced a train along a country road, quite an erie feeling in the dark with just headlights of the locomotive. I screamed! We all laughed. And I can honestly say my goal of making new friends out of this experience is coming true. Thanks Jane Jean Carrisa (yes spelled like that!) and Carlan for the great time and friendship. I put diva in a stall for the nite when we get back, and was off to bed. I laid in bed and of course Katy was there with me. "You're hot n you're cold. You're yes n you're no. You're in n you're out. You're up n you're down." what a Roller coaster ride of a day! I hope the song changes tomorrow. So I have to give credit to my new niece-in-law for inspiring me to do this blog. She blogged their honeymoon and it was so great to follow their European trip, that I decided I would do the same about my walking horse experience. So here goes. As some of you know I bought a new walking horse and have it in training down in Tennessee. 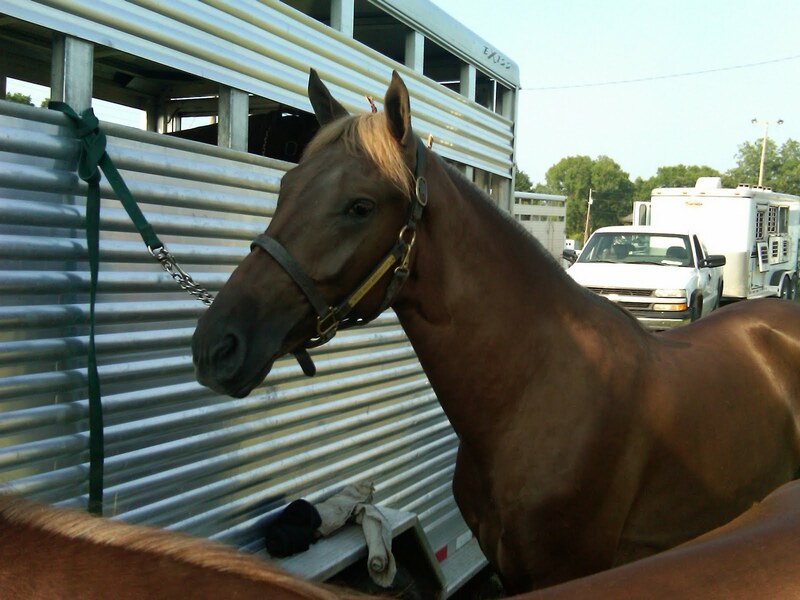 Bourbon (or more officially, Watchin for the Storm) is now 2, and I have been showing him in TN this summer. I guess that's where this story begins. I then was treated to a home meal and BEER. Yeah! Something to calm my nerves. Although I'm sure poor Jane was exhausted by my nonstop conversation. I had 12 hours of talk pent up from the trip. And, I think I was hell bent on catching up! (sorry Jane!). Then off to a nice shower and into bed. Exhausted and very excited for tomorrow and the week ahead. So my story begins. And I guess you all will be able to follow me. And (hopefully) share in some successes, and I'm sure the agony of defeat. I'm excited. I'm nervous. And I pray for good clean rides, and at least to be noticed by the judges. So here's to giving it a go. Wish me luck!